I wasn't sure if it would happen in my lifetime, but there are a growing number of politicians who are against Supply Management ("SM"). Maxime Bernier is running for the leadership of the Conservative Party of Canada. He has come out as unequivocally against SM. "...Article 117 of the Conservative Party Policy Declaration affirms the party’s official support for supply management. As an MP and minister in a government that supported supply management, I was not in a position to question the party’s democratic decision, or cabinet solidarity. And so I went along with it like all my colleagues, even though I had grave misgivings about it for all these years." He recently told the growing lobby of farmers rising up against him that he won't change his mind. The Liberals won't change their mind either, as Ag. Minister MacAulay said on Feb. 6, 2017 in the House. It was the Liberals who originally saddled Canadian with this SM mess. From Confederation to the 1970’s, Canadian farmers suffered under the unfair predatory business practices of large agri-food companies, both domestic and international, while opposing lobbyists fought for the hearts and minds of procrastinating politicians. After a growing number of unbearable crises, Bill C-176 was proposed by the Liberal government as a solution, but it became the longest debated piece of legislation in the history of Canada. In the end, two all-night sessions of parliament and a last minute amendment finally resulted in passing the bill at 6:40 AM on Dec. 31, 1971, creating Supply Management (“SM”). SM was designed to protect Canadian farmers from predatory business practices, and end boom & bust cycles. Unfortunately, SM has done the exact opposite. Former Prime Minister Brian Mulroney came out 2 years ago against SM, suggesting a generous compensation package for SM farmers when it is abolished. Mulroney repeated his rally call against SM in a keynote speech on Feb. 2, 2017 in Edmonton AB. Truly, a rare bird; a politician who is against Canada's Supply Management (SM") System. A few years ago, SM lobbyists helped arrange an unanimous vote of support in the House of Commons. A chilling example of the power of the SM minority. 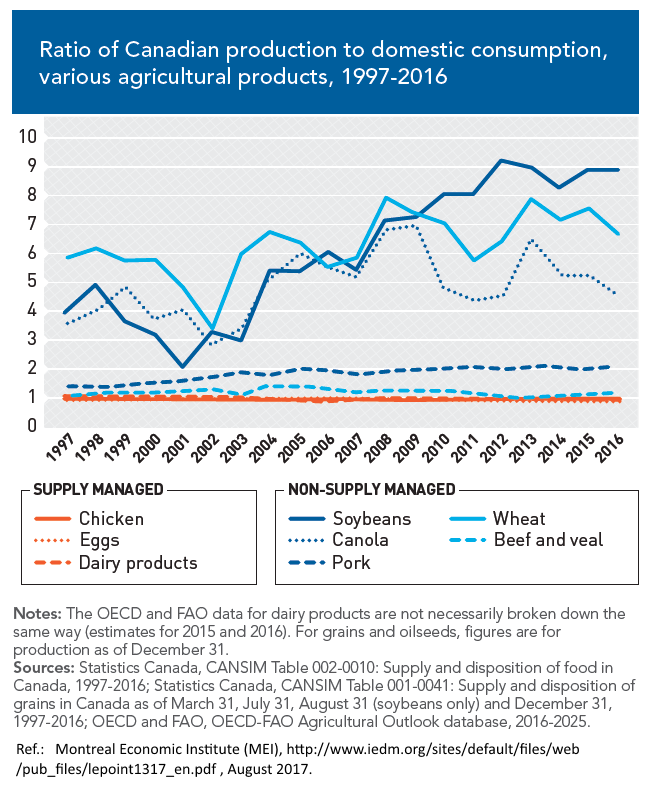 Canada's Supply Management System for chicken, turkey, eggs, and dairy is a dysfunctional, inefficient, ineffective, and mediocre tyranny imposed on 35 million Canadians by just 17,000 farmers, their paid lobbyists, and political friends. 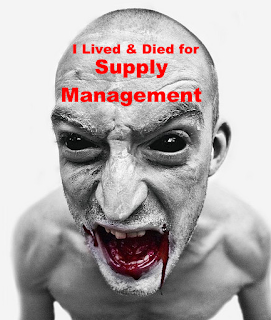 The 17,000 SM farmers who "own" the Supply Management system are all multi-millionaires. They became multi-millionaires by stealing away the rights and freedoms of consumers and all other non-SM farmers. I am a Small Flock Poultry farmer (ie. I'm a non-quota, non-SM chicken farmer). The 60,000 or so small flock poultry farmers in Canada is one group that suffers under the despotic control of the SM system for chicken, so that 2,700 SM chicken farmers (just 4.3% of all chicken farmers in Canada) can rule the roost. I call it "Chicken Apartheid". See our Blog http://canadiansmallflockers.blogspot.ca for the scary details. Under SM, Chicken Apartheid has been in Canada for more than 4 decades. SM lobbyists and their propaganda press releases say SM "protects" Canada’s family farms. However, the truth is opposite of what SM lobbyists claim. For example, from 1966-2011 (the full reign of SM for chicken), 88% of Canada's chicken farms have disappeared. The SM chicken farms that are still here are now huge CAFO chicken factories owned by multi-millionaires. Similarly sad statistics exist for the other 3 tentacles of the SM beast (ie. dairy, eggs, and turkey). SM farms (dairy, chicken, turkey, eggs) are just 8% of all Canadian farms, but SM farmers are the best paid of all Canadian farmers, earning 21% more than non-SM farmers. SM farmers and their deep pockets unfairly compete against all non-SM farmers for the same limited resources in farming (eg. farmland, tractors, animal feeds, Vets, Ag. specialists, etc.). SM is bad for all non-SM farmers. SM is also bad for Canadian consumers. In Dec. 2015, the Food Institute at the University of Guelph announced that food inflation in Canada is the highest in the world, topping 4.1% in 2015. It will be more of the same for the near future. While all food prices are on the rise, the SM commodities (ie. chicken, turkey, eggs, and all dairy products) are 37% to 300% more expensive in Canada than the prices paid by most of the Western world. The price gouging of Canadian consumers is designed into the SM system. For example, for someone earning Ontario Minimum Wage between 1995 and 2005, the affordability of chicken dropped 31.7%. Since chicken has historically been the cheapest meat available, if you can't afford chicken, you are forced to become a vegetarian. Health Canada reports that 7.6% of Canadians can't afford the food they need to feed their families. In the North, rural areas, and on First Nation reserves, as many as 63% of families have food insecurity. For example, in Rankin Inlet, Nunavut a whole chicken sells for $80 to $90, 4 to 5 times the price paid in Toronto ON, making chicken unaffordable by most families. Two thirds of Canadian deaths are caused or contributed to by poor diets or poor nutrition. Getting rid of SM will help make better, more nutritious foods more affordable for all Canadians. Now is the time to get rid of SM, before we have food riots, mass starvation, or rising epidemics of sickness. We will see in time if the censors at the Montreal Gazette are just as ruthless. Max has SM farmers organizing against him by buying up memberships in all PC ridings across Canada so as to ensure Maxime doesn't win the CPC nomination. If Canadians stay asleep throughout this leadership race, the organized SM farmers will exert an overwhelming influence, far more than they should, crushing Maxime. All politicians of all stripes will learns an infamous lesson that going against the SM lobby is suicide. If the SM farmers are allowed to buy the continuation of their multi-billion dollar SM boondoggle at $15 per membership, it is Canada and all Canadians who will lose. Nobody will make that same mistake for many more decades. You have until 5:00 PM EDST on March 28, 2017 to spend $15.00 to become a member of the Conservative Party of Canada. The ranked ballot secret vote will be held on May 27, 2017 for all party members. Today, SFPFC has endorsed Maxime. Personally, I have become a member of CPC. I intend to vote as a 1-issue candidate for Maxime. I ask all Small Flockers and their friends to do likewise. The Stratford Beacon Herald reports that a new chicken hatchery is scheduled to be constructed in Stratford Ontario, starting in May 2017, producing up to 16 millions chicks per year, starting some time in 2018. This farmer-led partnership will use the latest technology from Europe, HatchCare providing the chicks a light, feeding and watering as soon as they hatch. It is hoped that this will reduce the industries dependency on antibiotics. There are a total of 40 or so postings on his issue. You can find them all by typing "antibiotic" in the search box in the top of the right hand column of this Blog. If you dare read some of these posting, you may never be able to stand the revulsion of buying factory chicken again. Dr. Blaser's best selling book Missing Microbes notes how humans are now subjected to various epidemics from the over-use of antibiotics. He notes that this is being fought against for Caesarean births by the inoculation of the child with the mother's flora and fauna that the child misses by skipping the trip through the birth canal. What about the baby chicks that are stolen from their parents and hatched in a sterile incubator? Can we not avoid the majority of the disease and early death of chicks by prudent inoculation of the baby chicks with farm specific starter mix? This would be the same as being naturally hatched under Mom and living in close proximity to her in the chick's early days. HatchCare share some research that floor eggs (found on the barn floor instead of the nesting boxes) are more contaminated, tend to explode during incubation, and of lower average weight upon hatch. Attempts to wash the eggs, or fog them with disinfectants don't make it much better. If that contaminated mucous dries quickly, and the humidity is kept in he proper range, there is some (but not too much) inoculation of the egg shell, absorption through the shell and membrane, and to the chicks that eventually crawl all over the cracked shells when they hatch. I agree that they need some of this natural inoculation, but not too much. Note that the chicken's vent is the single opening that discharges the chickens' feces and its eggs. The eggs are naturally coated by the feces contaminated mucous that quickly dries on the exterior of the egg. This mucous tends to seal the pores in the egg shell, limiting the microbes that pass through the shell. Chickens naturally share the flock's shared biome by consuming small amounts of their own feces (recycling), as well as the manure of their flock mates (cross-inoculation). This helps ensure a homogeneous biome shared by all members of the flock. However, the hatchery barn inoculation doesn't get them inoculated to the very different biome that exists on the farm to which those chicks are eventually sold. A flock naturally develops a symbiotic biome of bacteria, protozoa, virii, and other microbes that is unique to its micro environment. Inoculation with a different biome will not adequately acclimatize them for the specific destination for those chicks. That means each farm would have to develop its own unique blend of microbes to which their chicks are inoculated. I tried to do this for my chicks in my on-farm brooder by starting with well composted litter that was re-used from the previous flock. CFO quoted the CFC rule book to me that assume all farmers will use antibiotics, and I soon received a non-conformance from CFO in my on-farm audit. Presenting these theories and supporting research to CFO and CFC did no good, the rules are the rules, no exceptions, no discussion. I was forced to remove all used litter from my brooder, immediately clean and sanitize between flocks. Starting with clean litter, there is nothing in the CFC rule book that says I can't inoculate that new litter with some of the composted prior litter. So that is what I now do. As soon as the previous flock has left for the green grass pastures at 3 weeks of age, I crank up the heat to maximum, composting the old litter for 24 hours. I save a 45 gallon drum of this composted litter, taking the rest to the compost pile. I clean sweep and sanitize the brooder, and fill it with clean shavings. I then sprinkle some of the old composted litter into the clean shavings, inoculating them with my farm's natural biome (approximately 0.01% old, 99.9%+ new). I hope that this adequately inoculates the chicks with what they will eventually be exposed to when they go out to pasture. To improve on this method (I have not yet done this step, but think I will in 2017), I suggest adding to your compost inoculant a garden rake full of green grass clippings and a shovel full of topsoil taken from your pastures (each pasture if you have more than one, or multiple samples randomly distributed over your one pasture). Mix that with the old brooder shavings to create a hybrid biome, incubate it with the right moisture and C:N balance, and use this to inoculate your brooder. You don't need much inoculant, as the brooder temperature and humidity will rapidly grow any microbes that are inoculated. As the chicks grow, the concentration of the biome microbes in their liter can also grow. You do not want to overwhelm the chick's immune system or its gut bacteria by a high concentrated dose. With this combined biome inoculate and apple cider vinegar (with mother of vinegar if possible) in the drinking water supply, I believe you can operate without antibiotics or coccidiostats. Please let me know what you think, your alternative methods, or ideas to further improve our small flock technology. We are an artisanal farmer who grew chicken last year. We still have quite a bit of chicken left that we processed in November. They were grown free range and on a vegetable based feed. They average 4.5 lbs dressed and they are frozen and whole in vacuum packaging. Do you know of anyone looking for free range chicken? We are just deciding how much to grow this year. Any help would be appreciated. When CFO announced the Artisanal Chicken program, I had a tough decision to make: stay Small Flock, or become an Artisanal Chicken farmer. Everybody told me the customers would beat a path to my door, so I applied for and was authorized to raise 3,000 chickens last year, the max. available. I decided to do grass pastured, free range chickens as I feel this is the best opportunity, the type of chickens people want the most, people are willing to pay a premium price, and have much less competition with the commercial, factory farm chickens that are sometimes sold as a "lost leader" in grocery stores (as low as $1.49 per lb). 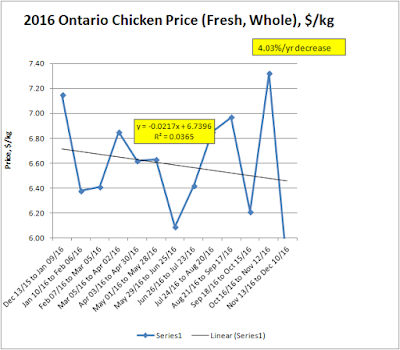 Statistics Canada reports the average fresh whole chicken retail price in Ontario in 2015 is $6.69/kg ($3.04/lb). 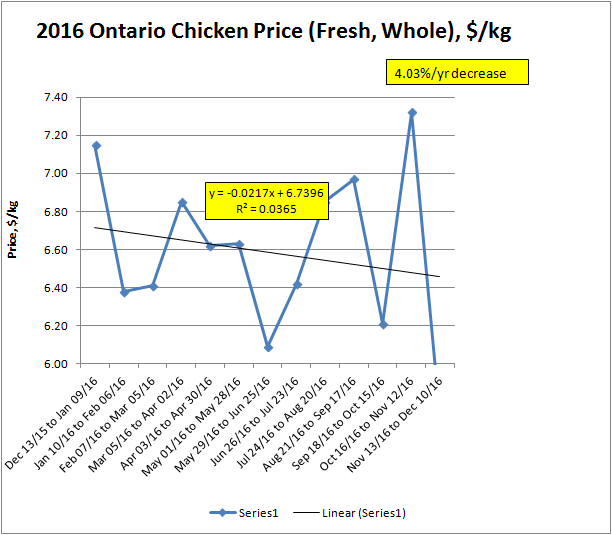 The average price for 2016 was $6.59/kg ($3.00 per lb. ), down an average of 4.03% per year. In my home town market, the historic market leader for commercial, locally grown barn raised chickens are raised and sold at $3.85/lb in 2016. I decided to sell our chickens at $4.50/lb, then backed off to $3.85/lb for fresh, never frozen (only available the 2 days after we go to the abattoir). I now sell frozen chickens at $4.50/lb due to the higher cost to freeze and store them long term. In Ottawa, they sell grass pastured whole chickens at $6.00/lb. in retail stores. When I ask other Artisanal Chicken farmers: "Is it tougher to grow them, or sell them? ", everybody agrees selling is the tougher nut to crack. Unfortunately, I too have many chickens raised in 2016 that I still need to sell. When I calculate that my first flock was available to sell in June 2016, and the last was November 2016, and my next flock thereafter will only be ready in June 2017, so there is a 7 month hibernation when frozen chicken must supply the local demand. At the rate of sale from June to Nov. 2016, if I project that same rate for the 7 months of winter 2016-2017, I come very close to 3,000 chickens total that will be sold. That calculation suggest that my freezers will run empty just as the first flock of 2017 is ready to go to the abattoir. Therefore, maybe I shouldn't worry. However, projections to the future are very inaccurate. Rather than trust in this bare hope for the future, I suggest a proactive approach. * Partner with a local appliance store for a 10%+ discount for your customers to buy a freezer to store their own food, then fill it with your produce. Buy a used propane fired convection oven, put it in an enclosed utility trailer, find a grid of sites (every compass point) around your farm where you can go to sell roast chicken (whole roasted chicken to take home, or 1/4 chicken dinners for one person), advertise that you will be at that site on a regular basis arranged in a sequence that doesn't rob customers today from where you will be next time. Start small so you are sure to sell out, or you can eat your unsold product excess (or sell it as frozen cubed chicken pieces for chicken Caesar salads or stir frys). Record the time of each sale. As soon as you sell out, leave a sign that late arriving customers know they missed out, call this # to reserve a chicken for next week, and head home with your cash. Based on your sale rate, estimate how many chickens you can sell in a reasonable time on location. Food truck selling quarter chicken dinners at local fairs, hockey tournaments, and other events. Perhaps Arisanal Chicken Farmers (and/or Small Flock Chicken Farmers) can work co-operatively on solving this marketing challenge. I ask everybody, Small Flockers and Artisanal Chicken Farmers, to use the comments section below to share their favorite sales & marketing method, or comment on the above.